For over 100 years Oxford World’s Classics has made available the broadest spectrum of literature from around the globe. Each affordable volume reflects Oxford’s commitment to scholarship, providing the most accurate text plus a wealth of other valuable features, including expert introductions by leading authorities, voluminous notes to clarify the text, up-to-date bibliographies for further study, and much more. You can follow Oxford World’s Classics on Twitter and Facebook. Subscribe to only Oxford World's Classics articles on the OUPblog via email or RSS. Scotland was selected as the Oxford Atlas Place of the Year 2014. We invited several experts to comment on the decision and Scotland’s phenomenal year. Scotland has remained in the media spotlight throughout 2014 for one reason: the referendum on independence from the United Kingdom. This was the most significant event to have taken place in Scotland since the creation of the Union in 1707. But it hardly presented an edifying spectacle to the outside world. Nationalists constantly complained about England, describing every utterance by a Unionist politician as “cack-handed” or “an insult to the people of Scotland”. Celebrities such as Sir Paul McCartney, David Bowie, and J.K. Rowling who publicly backed the Union were subjected to appalling online abuse. Financial projections were produced which might politely be described as misleading. The proposals for an independent Scotland, in preparation since the foundation of the SNP in 1934, were marked by an astonishing lack of detail — voters were not even told what currency the new state was to have. The official Unionist campaign showed a crippling lack of passion; politicians argued for the status quo while pretending not to. Most Westminster MPs, aware of their unpopularity in Scotland, opted to say as little as possible. Three Scottish MPs from the Unionist camp stepped in to fill the vacuum: Jim Murphy, George Galloway, and, very much at the eleventh hour, Gordon Brown. Brown’s passionate speech, the finest of his career, delivered on the day before the vote, left everyone wondering why he had not become involved in the Unionist campaign sooner. The campaign, indeed, had dragged on for three years. The SNP might have been expected to hold the referendum soon after their election to government in 2011. But the year 2014 appeared propitious: it was the year of the Glasgow Commonwealth Games, which could be expected to give a boost to nationalist sentiment, and of the 700th anniversary of the Battle of Bannockburn in 1314, at which the Scots had destroyed an English army of invasion, leaving the way clear for retaliatory Scottish raids on England. In the event, the Games were hailed as a triumph for Scotland, but had no effect on nationalism, while the Bannockburn anniversary was greeted with widespread indifference, with thousands of tickets at the commemorative event remaining unsold. The 100th anniversary of the outbreak of the First World War, in which Scots and English had fought and died side by side, carried a more meaningful resonance. When the referendum was finally held, independence was decisively rejected. 1,617,989 Scottish residents voted for independence, out of a voting age population of 4,436,428: that is, 36.47%. The leader of the independence campaign, Alex Salmond, had declared immediately before the vote that the result would settle the matter for a generation; immediately after it, he challenged the result and called for a second referendum to be held as soon as possible. His colleagues in the SNP, meanwhile, floated the idea of a unilateral declaration of independence: the support of a majority of the people of Scotland, not having been forthcoming, was no longer deemed necessary. In the days which followed, the losers formed themselves into a group called “the 45” (44.65 per cent of those who voted had voted for independence). The name “the 45” recalls, of course, the doomed Jacobite rebellion of 1745, in which ordinary Scots were driven by their highland lords into an ill-advised invasion of England, and were roundly defeated, with catastrophic consequences for Scotland. 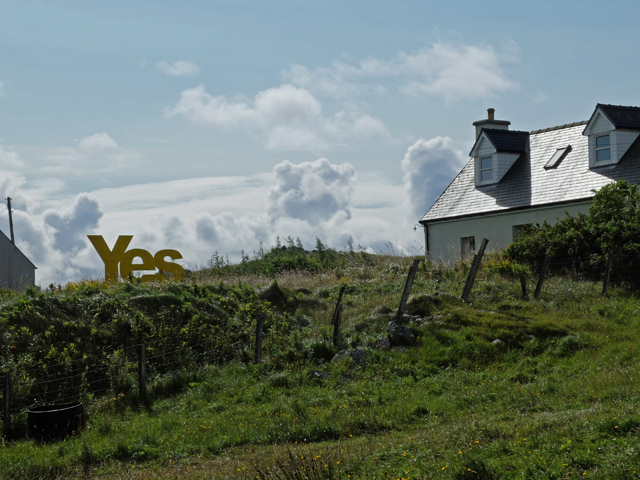 Sign in Greinetobht in North Uist supporting Scottish independence by John Allan. CC BY-SA 2.0 via Geograph.org.uk. How does Scotland emerge from all this? The referendum exposed Scotland’s politicians to public view, caused old resentments to be stirred up, and led to the airing of attitudes that would have been better hidden. On the other hand, there was no serious violence and no bloodshed. It is enormously to the credit of the UK government that it permitted such a referendum to be held at all. The UK is now much stronger for having given the nationalists the opportunity to demonstrate that their supporters account for barely more than one in three of the Scottish voting age population. But what of overseas visitors who may be contemplating a trip to Scotland next year? Do come. Scotland remains a country of unsurpassed natural beauty with a rich and visible history and a warm and welcoming people. By virtue of its membership of the UK, Scotland punches far above its weight in world affairs. Its language is English and its currency remains the pound sterling. The visitor to Scotland will find that there is one particular subject on which its people are united in not wanting to talk about: the 2014 independence referendum. Headline image: The debating chamber of the Scottish Parliament Building by Colin. CC-BY-SA-4.0 via Wikimedia Commons. 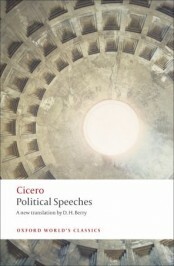 D. H. Berry is a Senior Lecturer at the University of Edinburgh and the translator of Cicero: Political Speeches and Cicero: Defence Speeches in Oxford World’s Classics. I’m sorry but this article is full of fallacy and misrepresentation. To cite but a few errors, George Galloway may be Scottish, but he is not ‘a Scottish MP.’ He stands for an English constituency. He is unelectable in Scotland. If 36% of the entire electorate (1.6 million out of an electorate of 4.3 million) voted Yes, by a similar measure only 46% (2 million out of 4.3 million) voted No. Or less than 1 in 2. Those who voted No did not vote out of love of the UK or strong identification with Britishness but out of a fear that Scotland was not ready. Lord Ashcroft’s poll in the immediate aftermath of the referendum indicated that less than 1/4 of No voters considered themselves more British than Scottish and voted No out of an identification with or concern for the Union. Scotland has been changed by the referendum and the momentum towards Yes continues to gather pace. A recent opinion poll put support for independence at 52%. The SNP have quadrupled their membership which now approaches 100,000, making it a mass party in Scotland and the third largest political party in the entire UK. The other pro-independence parties have also quadrupled their membership whilst the principle Unionist party in Scotland, Labour, has gone into meltdown. Support for Labour is at least 20 points behind the SNP. The Greens are rivalling the Toried. Darling and Brown have anounced they are to step down in May 2015 rather than face the humilation of a wipeout of their party in Scotland as the voters punish them for their treachery by their close association with the Tories during the referendum campaign. The Labour leader in Scotland Johann Lamont resigned in October amidst accusations that London Labour was treating Scotland like a branch office. Labour’s troubles continue. They look likely to disappear in Scotland just as the Tory MPs did. There is considerable distrust of and disaffection from the mainstream media to the extent that a new daily has been launched, The National, which is pro-independence. This is an extraordinary phenomenon in an age where newspaper readership is declining. There has been an explosion of online Scottish news blogs and sites such as The Scottish Statesman or Bellacaledonia. Mass meetings continue to be held, amongst them, Women for Independence, Radical Independence Campaign and Commonweal, which is about to launch CommonSpace, an online news format. The Scottish News will also launch in the New Year. An entire alternative media is being built. The independence debate has invigorated Scotland and that vigour for political debate shows no signs of dying down. All in all, the Union is not saved, it is on life support. If the Conservatives are elected in May and pursue their policies of an EU referendum which would pull Scotland out of the EU even if it had voted by majority to remain, or else pursues its policies of English votes for English laws, then these will likely be the straws that breaks the camel’s back.